Beret with a simple cross stitch. Free Pattern. When I write a pattern I usually hand write it whilst I am making the garment, then I make another garment whilst I type the pattern, this usually corrects any mistakes that I may have made. How ever I did not follow this process this time. 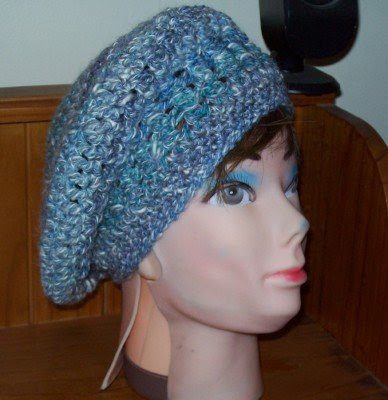 So I would very much appreciate your feed back if you make this beret using this pattern. 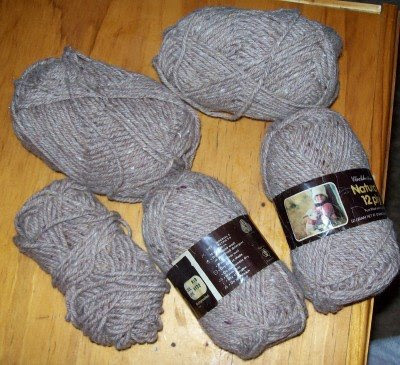 Below is the yarn I used, it took 1.5 balls (approx) to complete the beret, the yarn does not refer to it's ply. 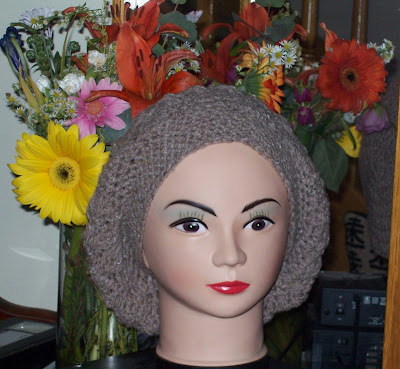 Below is the completed beret in a medium size. Ch 3, work 1 dc into same space as ch 3, work 2 dc into each dc around, sl st into top of ch 3 to join (24 dc), my count will always include the first ch 3 as a dc. Ch 1, work 1 sc into each sc around, sl st into ch 1 to join (60 sc) This is the above row, referred to for the 3 sizes below. Remember to sew in all loose ends. Try the beret on whilst making the sc rounds for your tailor made fit. I would appreciate all feed back (good or bad) on this pattern. I hope you enjoy your Beret. 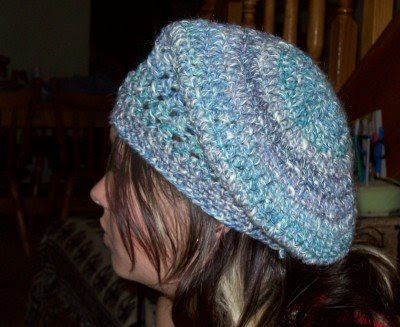 I will have more free patterns to come in the very near future so stay tuned. 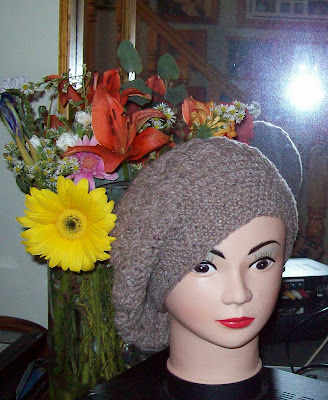 Just to add, here is a link to the completed beret by another blogger. 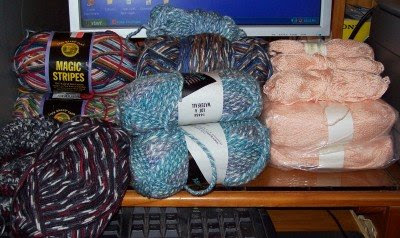 No I am not telling a long story here, just thought I would share with you some pictures of some lovely yarn I have been sent from the US. It's all for charity, fire victims and fund raising for the fire brigade. Thank you for your generosity! Below is some yarn from Octobermoon. 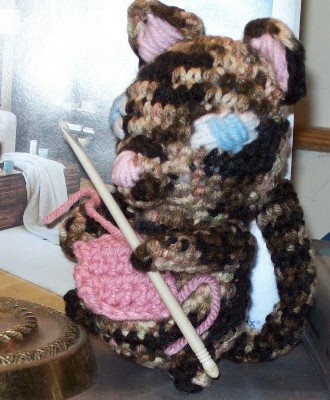 Below is some yarn from Rachel G.
Below is a left handed, crocheting cat that Rachel G made for me! If you look closely at the yarn choice here in this beret, you will notice it is from the first lot of yarn I received from Octobermoon. 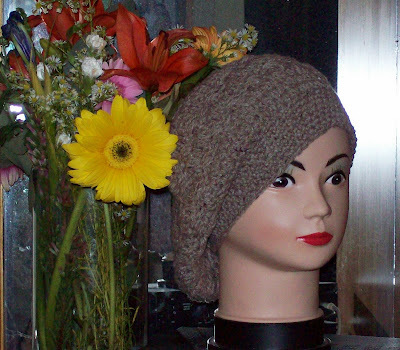 The pattern for this beret will soon be uploaded to my blog for free for all to use. Pocket Scarf. Free Pattern. Easy. 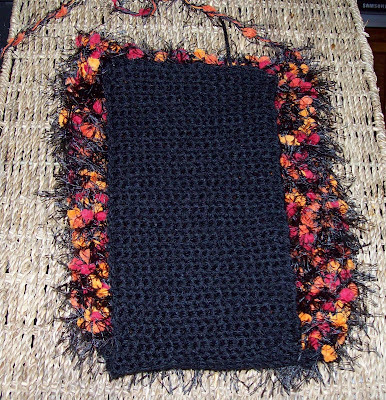 Pocket Scarf, side on pockets. When I was thinking of the design for this pocket scarf, I originally planned for the pocket opening to be along the top of the inside of the scarf, but the more I thought about it and as the scarf progressed, I realized that a side pocket entry would be much more easier to use. Just like the pockets on the sides of a pair of slacks. 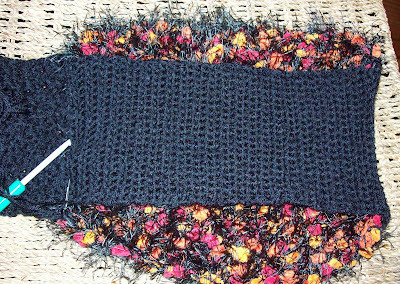 I have made the scarf section in a griddle stitch pattern, but it could be just as easily made in a single crochet stitch pattern. 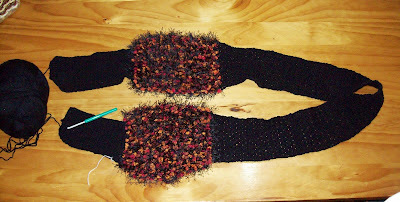 I also allowed for some stretch in the scarf I made, as it is made from acrylic which will stretch slightly. 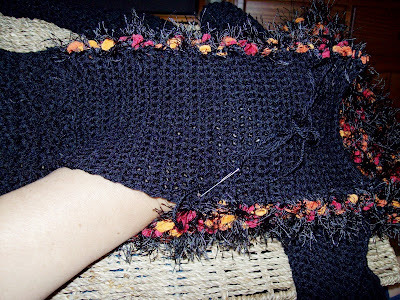 The contrasting colored yarn which I used was much thicker than the main colored yarn. 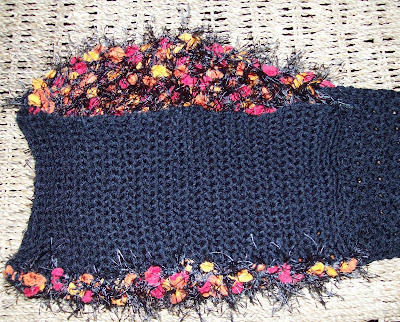 How ever this did not destroy the look of the scarf, in fact it added a much warmer pocket. 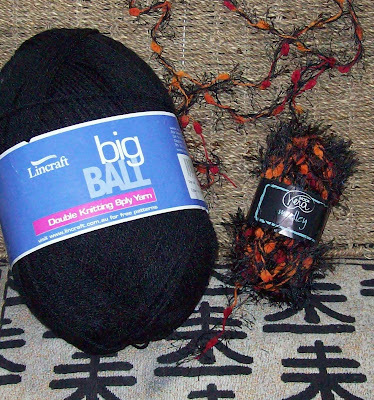 My suggestions for a contrasting yarn would be for a feathered type yarn, eyelash yarn or a crazy type yarn. If you find any of these too thin, just keep using the main colored yarn along with it, (2 strands). 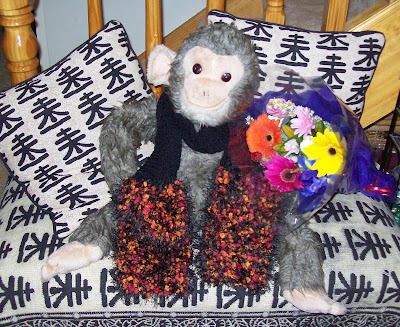 This scarf can be altered for sizing. I am of a medium build and height, so you can adjust accordingly. The same goes for the hands too. 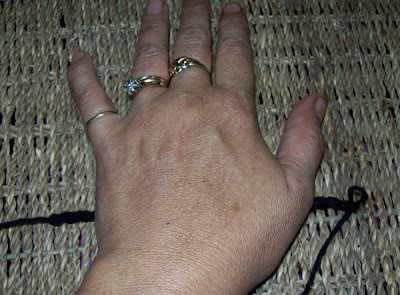 I began with a chain that was slightly wider than the widest part of my hand. 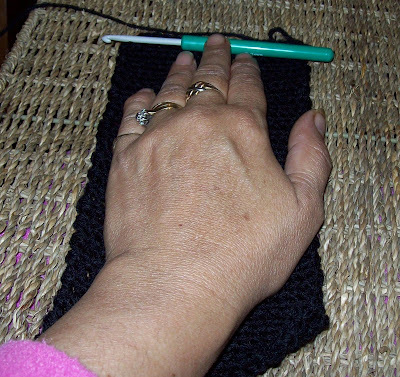 I also wanted an even number of stitches for when I began the griddle stitch pattern. You should now be on row 41 for small pocket or row 49 for large pocket. 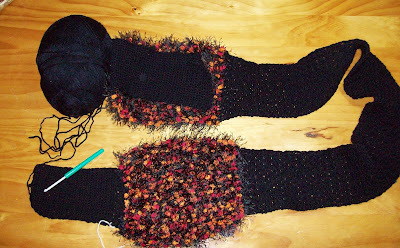 You will be changing to the contrasting color; this is done on the wrong side of the scarf which is an even row. Joining in fancy yarn on the wrong side will give you the full effect of any fancy yarn used on the right side of the garment. Repeat above row until your contrasting color is the same length as the rear pocket, if you have used a thicker contrasting yarn, the row count will not be the same. 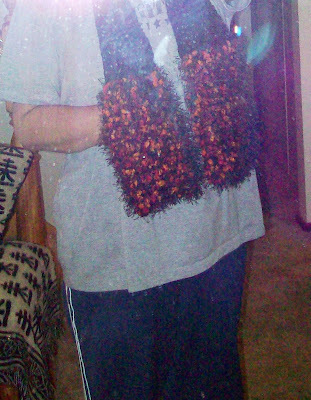 For my height (5 foot and 4 inches) and comfort I made the scarf (in between both pockets) 49 inches long. 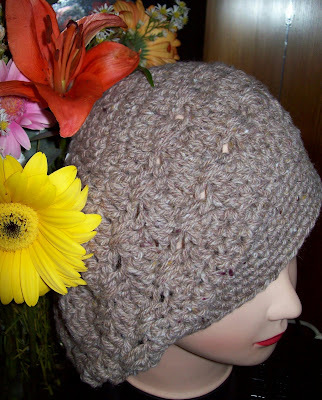 I chose to use the griddle stitch but a simple single crochet stitch can be used. Repeat above row for length required. Make the second pocket the same length as the first pocket, ending on wrong side. 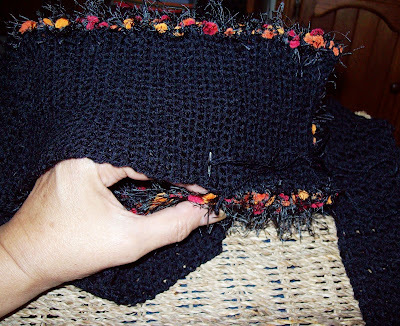 With right side facing, fold the bottom rear of the pocket to the top rear of the front pocket, place this in line with the centre of the scarf and sew the edge across the top rear of the pocket (not the scarf). 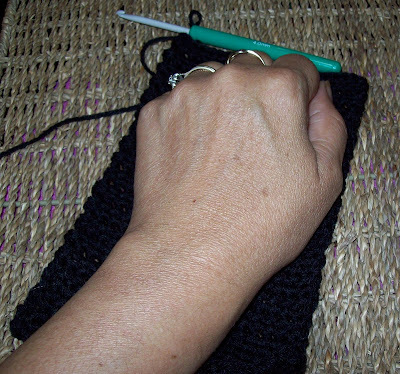 I used a simple whip stitch one way and turned to repeat for extra strength. Sew the side of the pocket that faces inward to your body closed. Sew the outside of the pocket from the bottom edge up wards, leaving an opening large enough for you to place you hands into. You may have to try the scarf on a few times to adjust the pocket opening. I sewed mine almost ¾’s of the way up. 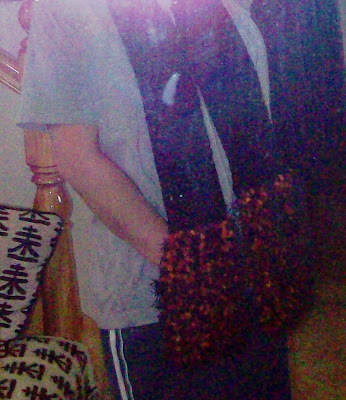 Here a a couple of really bad photo's (LOL) that shows you 2 ways to wear the scarf. I'll try and get some better model picture's. You can wear it long ways. And you can also wear it short ways. Wrapped once around the neck. Well, with all of this house selling and buying business, it has kept me quite busy lately. 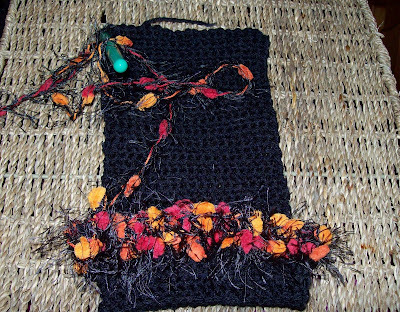 Although I kept on crocheting small items such as dish cloths, it was not much of a challenge. My step son came for a visit and reminded us of how soon our next grandchild will be born. Two weeks! on the 17th of April. Oh my god I thought, what do I have for our newest arrival? Well I know they are expecting a boy and I knew I had a couple of baby boy cardigans made, but something else was needed. 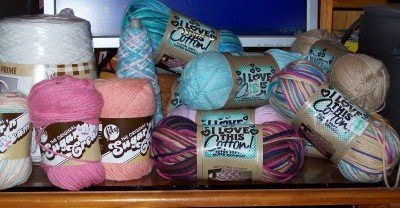 I had a bag of scrap baby yarn, shades of blue, white and cream, perfect starter. Now what to make? 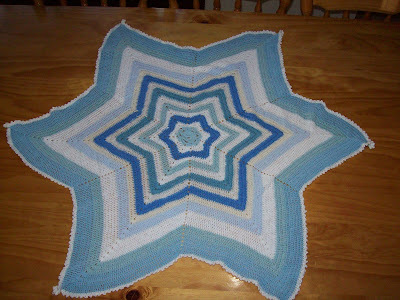 I thought a starghan would be different and searched for a 6 pointed babyghan pattern, there are plenty out there for free on the internet. I came across a simple written pattern and began with that one. I should have had more confidence with my crochet ability and adjusted the size of the corners in the beginning of the pattern as it became too tight in some area's, then when I did increase in the corners it would also become too loose. 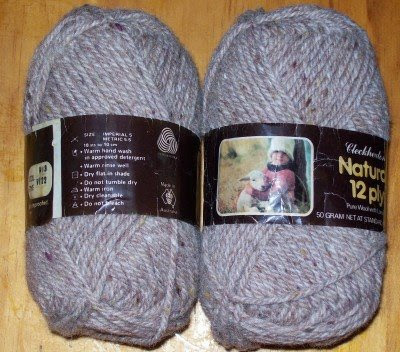 It did not help at all that I was going from 3 ply yarn to 4 ply yarn, so once I had the ball rolling and knew what to do, the whole thing became more even. I used a size 3 mm hook through out and it was oh so slow, especially when I was using some yarn that would split if I was not careful. It took me 5 or 6 evenings, so that was not too bad at all. So here is the out come, I have since washed it and also used a lovely smelling fabric softener, when it has dried I will try to block it for better shaping. I have another project on the go now, it will be one with a free and easy pattern for a winter item, so I'll be back with that one soon. 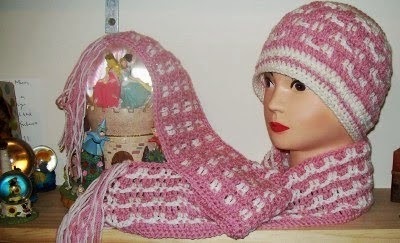 Here is the original link to the free pattern I have used here. Oh Dear, Things Are Happening So Quick! I wrote about my house being up for sale on Monday the 23 of March, by Thursday 26 of March my house was sold! We had 4 lookers and 2 buyers in that time, we accepted the offer that gave us our full asking price on the house. I had been down to view some some more houses in the small township we had chosen to move to in between those days. There seemed to be nothing on offer that suited us, but we had seen the out side of a relocated display home the week before. So I booked an appointment to view the house from the inside. After much discussion and doing the dollar figures we decided on that one. But we had to crunch the seller on the figures a bit to make it worth our while. As it is a relocated house, there is much to do on the outside. It sit's on a quarter block with a double car port, so you can imagine all of the extra's we need, to improve the block. It's almost like a new home, even though it has been a display house, we will be the first to actually live in it. Down went the deposit and we are currently in the waiting stage for our buyers finance to be approved. So that is where I have been of late, in the real estate world, which I knew barely nothing about until just recently. 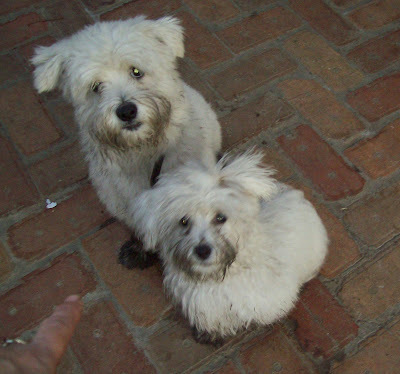 I thought I'd throw in some picture's here of my naughty dirty dog's. 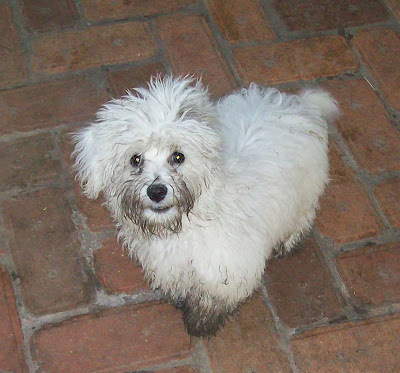 Dad (Louie) look's remorseful for getting dirty, but playful and naughty little Rev, doesn't seem to care, he was out having fun!